Center for Congregations, June 2016. Accessed November 19, 2018. Education events that further your knowledge base and provide new ideas for your congregation’s strategy and mission are vital. However, when a lot of information is packed into a short timeframe, it can be challenging to digest the content. This short article provides practical guidance on how to get the most out of educational events, including picking the right event, creating a team, assimilating the information and implementing changes once the event is over. The Center for Congregations is well-suited to provide tips on maximizing the impact of education events as they have held these types of events for congregations in the state of Indiana for more than 10 years. 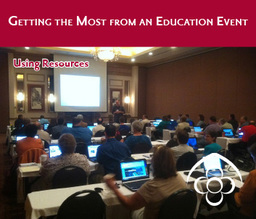 Make the tips in this guide part of your preparation for your next education event opportunity.